We are looking for articles that connect your work with this emergent style of leadership called Learning Leaders. We want to have illustrations of Learning Leaders in a variety of contexts, organizations, and age cohorts. We encourage leaders of all ages and positions to contribute stories that define themselves or another as a Learning Leader. Creative contributions and formats are welcome. There are many definitions of learning. Each definition highlights learning as an active lifelong process that can be considered to expand and elevate one’s knowledge, skill, awareness and meaning making capacities through inquiry, experience, and study. Learners with active curiosity explore the world in many ways including: reading, observing, dialoguing, doing, and engaging with others to co-create ways of being, knowing, and behaving. Learning is an ever expansive process – learners grow and develop. Just as there are many definitions of learning, there are many definitions of leader and many types and styles of leadership have been noted in the literature – from transactional to transformational, autocratic and democratic. Leadership is neither a unitary skill set nor a solitary activity – a leader is one who guides, motivates, inspires, and empowers self and others. We think Learning Leaders are a special breed. They express a growth mindset within an enduring curiosity. They seem compelled to ask “what if” and “what next” questions. Learning Leaders also ask “when” and “how.” When they don’t know the answer, they are prone to ask more questions. Learning Leaders are comfortable in a conscious stream of learning and are particularly noteworthy for their skills in environments of uncertainty and complexity. Because they continue to be learners, they are able to innovate and co-create in a multiplicity of settings. Learning leaders have the ability to motivate and ignite the best learning in themselves and in others to create new pathways that make a difference—hence the connection to Appreciative Inquiry. For this Call for Submissions, we are assuming a learning leader embraces the Appreciative Inquiry (AI) core principle of co-construction: connecting with others to learn and live in the “we” and “explore” and “embrace others and concepts from multiple sources.” The articles and submissions will give this principle life in multiple ways. For the May 2018 issue focused on Learning Leaders, we invite your thoughts, experiences, research, and perspectives on learning leaders. Do you know a Learning Leader? Who is it? How is the Learning Leadership expressed and experienced? Do you have a story about a Learning Leader and his/her impact? How do you experience Learning Leadership in your organization (business, government, nonprofit, school), or communities, industries, nations? What does Learning Leadership mean to you in your research or practice? How do leaders use learning in developing their own leadership style and that of employees and colleagues? How do education and learning diverge or converge in leading self and others? Why is it relevant to appreciate learning in leadership? Share stories and examples about leaders who learn. Who are the Learning Leaders at every level and in many age cohorts? What are the implications of and for intergenerational learning to/for leaders? How does an appreciative view of learning and leading help people and organizations to flourish? What is your dream for the future of learning and leading? The final written submissions will range from 500 to 2000 words. Art and graphics should be in high resolution and ready for publication. Poetry should be formatted for publication. Video links are also encouraged. Congratulations and all best on this exciting project and theme of Learning Leaders. I hope to contribute to this issue based on my more than 30 years of teaching adults/college students in an appreciative style, based on a model I call Enriched Leadership. All best and proud of you for elevating awareness and the discussion around this important topic. Thank you for your reply, and I apologise for the delay in responding. The Editor-in-Chief has been very ill in hospital, and I am now catching up with some of the work. I am the issue editor for AI Practitioner, and normally involved with the issue at a later stage. 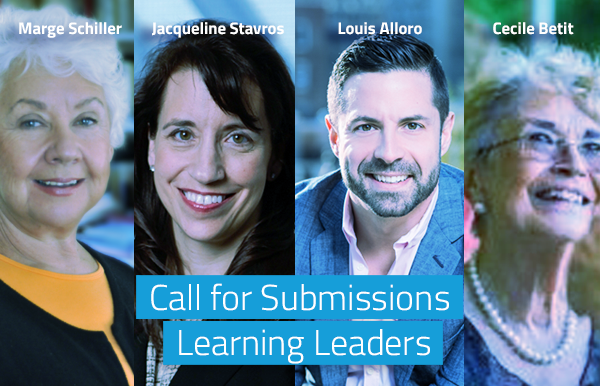 The editors for the Learning Leaders issue are louis@louisalloro.com; cgbetit@vermontel.net; margeschiller@me.com; Jackie Stavros . Contact them directly for further details about writing an article for the issue. Yes! This is a fascinating topic and I look forward to the edition in May. How do we contribute a proposal? Here’s hoping that all is well. I have e-mailed my submission to the attention of Mr. Louis Alloro as I had his contact information. I am hoping that this is the proper process step. If there is something else I need to do in this regard, please feel free to contact me at the e-mail address above. If you prefer to speak with me I can be reached at 807 355-6419. My sincere thanks to you, for your consideration of my submission.